What is a buyer’s agent/buyer’s advocate? Buyer’s agents work solely on the buyer’s/purchaser’s behalf. They find the right property, work out its true market value, negotiate the best possible price and if required, bid on the buyer’s behalf at an auction. Buyer’s agents utilise their years of industry knowledge and experience to achieve the best results for their clients. Buying property either for investment or as an owner-occupier can involve substantial risk. You want to be sure that your purchase represents value for money and the property is right for you. Rarely is intuition enough to scope out a good property. You need expert advice and that is what Guardian Property Specialists provide. The process of buying a home or investment property should be exciting, fulfilling and simple. Yet for most people, it can be the most stressful time in their lives. 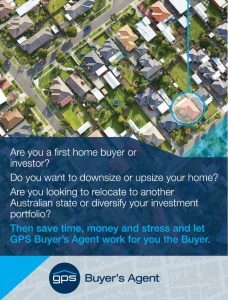 Using the GPS Buyer’s Agent will help you through the difficult process of buying a property and will save you money, time and stress. Our expertise in property investment and attention to detail is what sets us apart. We understand the market and know where the next property hot spots are likely to emerge. We guide you through the whole process from obtaining finance if it is required, right through to settlement of contracts. We are committed to helping buyers find the right property for the best price, terms and conditions. We believe that buyers deserve the same level of help that sellers have received for years. Working with an exclusive buyer’s agent will be an enjoyable experience as you have a dedicated professional on your side. What services are provided by the buyer’s agent? Initial discussions, either face-to-face or over the phone, to learn more about your needs. We take a snapshot of where you are today, perform a thorough debt, insurance and investment analysis and work with you to build a finance plan. Assist you with getting your finances right so you don’t over commit and you stay within your budget. In-depth discussion of your ideas, desires, requirements and financial capacity in order to help you determine the location, price, size and type of home or investment that is best suited to your situation. We provide you with numerous properties that fit your criteria for inspection at a convenient time. More than 50% of properties presented to you are not listed. We provide you with a thorough property research report including area profile, demographics, infrastructure, schools, transport, capital growth potential statistics and recent comparable sales. Once we have performed a thorough inspection of the property we establish a clear strategy upfront to ensure we achieve the highest levels of success. Get the property you want at the right price. Understanding the contract with your solicitor. Our aim is to secure your dream home or investment below its comparative market price. If required, a comprehensive report on your property claiming deductions as approved by the Australian Taxation Office (ATO). Who uses a buyer’s agent? As a first home buyer enters into the largest financial commitment in their life, it can be a very confusing, stressful and emotional time. They are prime targets for the unethical real estate agents as first home buyers can lack confidence with the whole process. We can provide the guidance, protection, expertise, advice and patience required. When you are looking to buy a property to live in, the search and selection of that property goes beyond the physical features to a much deeper understanding of your personal style, taste and lifestyle. As your buyer’s agent, we will take time to get to know you, your preferences and your needs at a detailed level. We have several years’ of experience specialising in property investment and we are completely independent. We have no preferred developer or estate agent and recommend properties only on their own merit. Our continuous research of the property market through our network provides us with the benefit of being able to compare opportunities in the various states and in the best property cycle locations. As we are independent property advisors, the entire market is available for you to choose from. We understand the additional requirements and special challenges of buying a property remotely. We tailor our service to overseas buyers to make sure every detail is taken care of. If you are not an Australian citizen and do not have a permanent resident visa for Australia, limitations are placed on the type of property you can purchase and your property purchase needs to be approved by the Foreign Investment Review Board (FIRB). Foreign investors can apply for FIRB approval to acquire residential real estate in Australia but approval is subject to strict conditions. If you are looking to buy a residential or commercial property, please fill in the attached form and one of our qualified buyer’s agents will tell you more about our services and costs.